(Video) Jay-Z Talks Fatherhood on New Album "Magna Carta Holy Grail"
US Magazine posted about Jay-Z talking fatherhood and the inspiration behind his new song "Jay-Z Blue" from the upcoming album Magna Carta Holy Grail in Jay-Z Almost Cries About Blue Ivy." 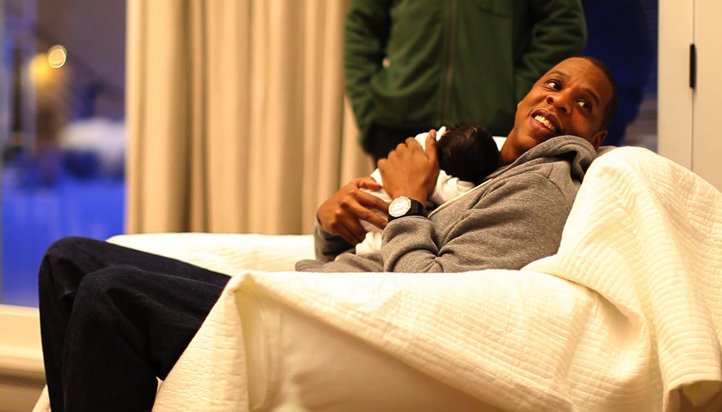 Jay-Z is obvisiously emotional as he talks about his new song and his daughter, Blue Ivy. In the new commercial for his album, you're placed "behind the scenes" with Jay-Z opening up privately with the one and only music producer Rick Rubin. Rubin's laying on a sofa and Jay-Z says, "[She's] something that we both created, you know, we still marvel at her..."
"It deals with, you know, my pop left when I was young, so he didn't teach me how to be a man nor how to raise a child or treat a woman..."
In a moment of holding back tears, Jay-Z says, "So, of course, my karma, the two things I needed I don't have, right?...And I have a daughter..." He continues, "It's the paranoia of not being a great dad." Catch the video now. If you can't view it above—it's here. What's your biggest fear as a parent? "Magna Carta Holy Grail" releases July 9. Here's to Blue Ivy growing up able to sing, "99 problems but a dad ain't one." Sorry, someone had too.